ATS Valley’s curriculum for primary years’ program aims at developing confidence and an understanding of children’s own strengths. Our curriculum is firmly grounded in our commitment to developing the full range of every student’s inherent aptitudes like moral, spiritual, linguistic, logical, personal, social, cultural and physical. We nurture the students in such an environment where they develop their own creative knowledge. We also help them in developing skills and competencies such as educational, technological, problem-solving to lead successful lives in today’s highly globalized world. The primary year’s program is deliberately designed to help children develop independence and respect as they learn so that they are prepared to embrace the opportunities that are present. And as the child grows and moves through higher levels of education, it is these learning skills that will be critical to their success. At a very young age, our children are immersed in thrilling adventures, where, with every rush of adrenaline, their confidence grows. There are various strategies we use to shape our children into confident young adults. It starts with an assembly roster. Every child from Grade 1 onwards has to, by design, speak in the assembly- a poem, a story, a Doha or anything relevant to the occasion. Research says that the most common fear in the world is that of public speaking. It is our commitment to help every student overcome that fear and the results of our efforts are all too evident. We also have a Theatre programme. Children from the Theatre group perform in front of the school on a regular basis and of course on the Annual Day. Children from Grade 1 onwards prepare small plays, which are then presented during lunch breaks. We have adopted a child-centric approach and our curriculum is based on the theory of Multiple Intelligences. Therefore we promote different areas of learning to keep in mind the fact that every child learns in a different way and at his/her own pace. In order to achieve this aim, we have introduced the “EDUCATION LAB” or “THE LEAPFROG PROGRAMME” for our students in Grades 1,2 and 3. At the end of each month, a monthly academic update (MAU) which lists the learning outcomes that a child has acquired by the end of a particular month is handed over to the parents in writing. The knowledge, understanding, and skills attained by a student on each topic are evaluated in an ongoing and regular process. 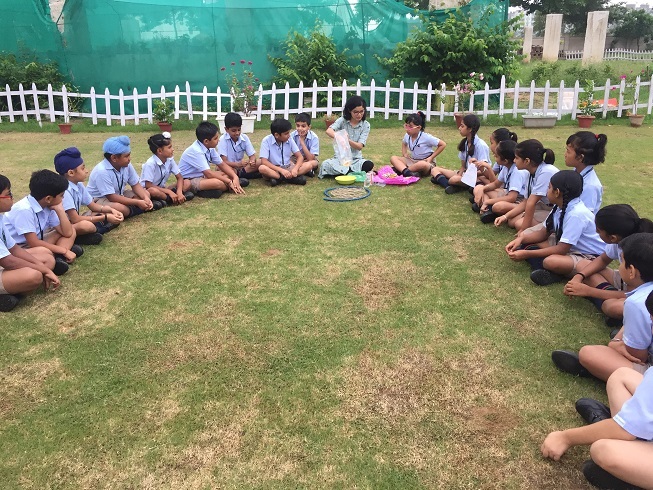 The assessment of student’s learning is made through regular teacher-student interaction and on the basis of activities that take place both in and out of the classroom. 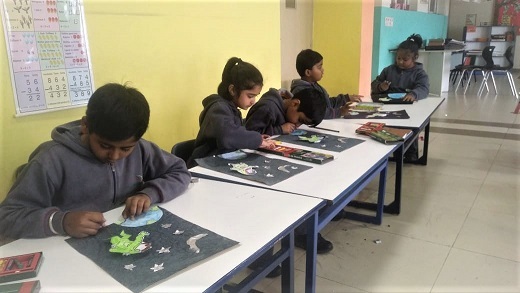 Students of Grade 1 did an art and craft activity related to the topic in E.V.S- Up in the sky. They collected used home foil of their lunch box. They made a rocket with colourful paper cutting.They also cut a picture of astronaut ,stars and moon with used home foil and pasted on a hand made sheet to show the picture of space. 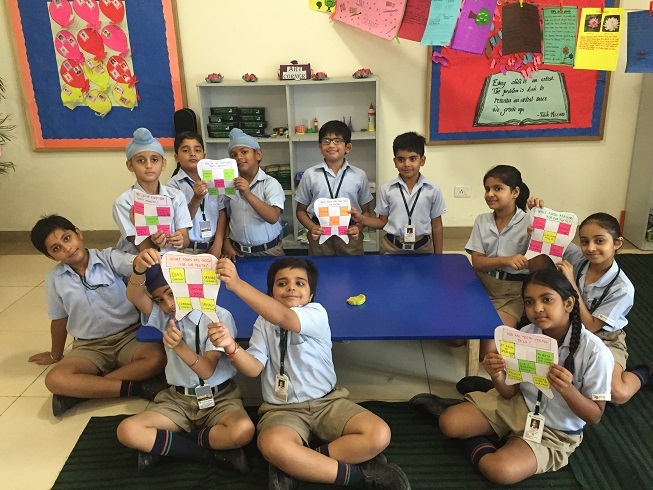 Students of ATS Valley School, Dera Bassi were taught the concept of measurement in a fun way. 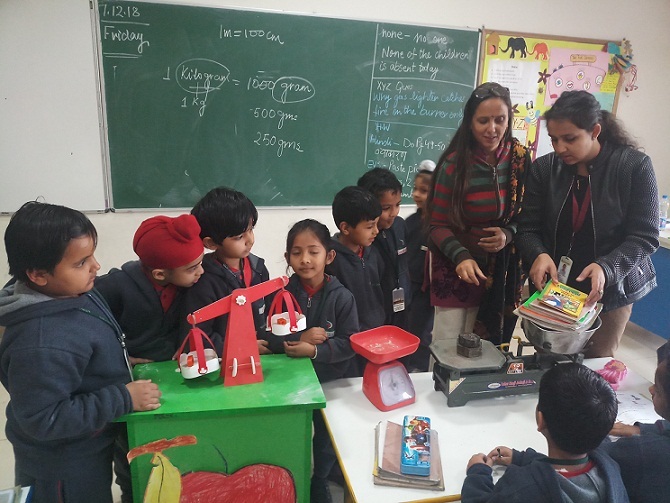 Teachers used innovative props such as weighing machine and balance to make students understand the concept well. 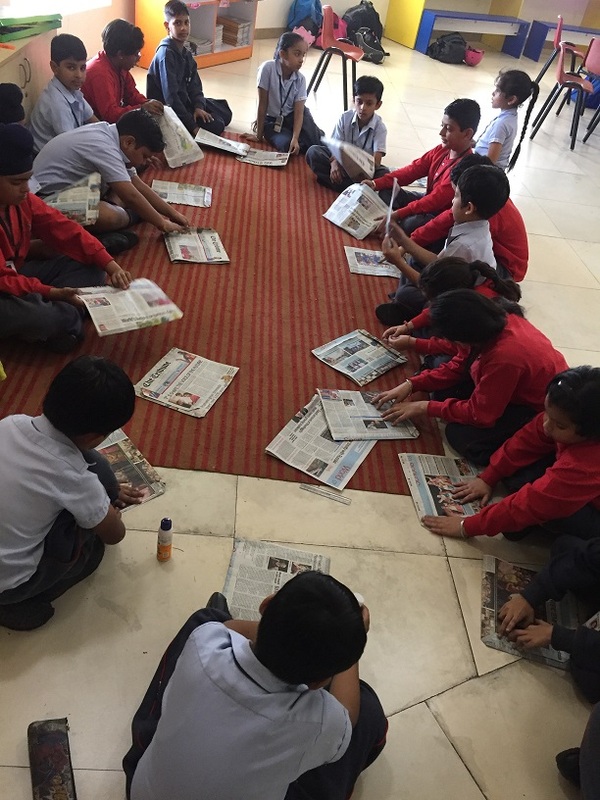 While learning the lesson on environment, Grade 3 learnt different ways of protecting the environment too.They learnt about recycling the paper, making useful things out of waste; and old articles. So, a fun activity that was done in the class on 29.10.18 was making the paper bags. Students used old newspapers and fevicol to make bags and then decorated their bags to make them attractive. They learnt that just by using two simple things they can create such beautiful bags. Also they came up with the idea of putting gifts in those bags and gifting it on Diwali rather than buying the bags from the market. Students of Class 1 did one activity on People at Work. They made envelopes and wrote their address on it and learnt how the postman used to go door to door to deliver letters. This way they have learnt how the messages were sent in traditional way earlier before this modern era, where we are dependent on electronic medium. 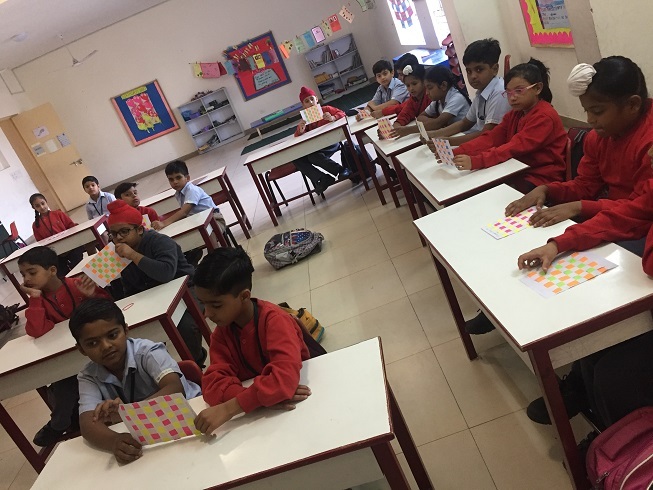 The students of Grade 4 were taught about the paper weaving for the chapter 'The right clothes to wear'. Weaving is a method of textile production in which two distinct sets of yarns or threads are spin together at right angles to form a fabric or clot.We tried basic paper weaving with bold colored paper. All the students participated actively in the activity. Trees are our friends and we should not cut them down. The importance of trees is well known to all of us. Tree plantation is a lifelong investment.It is one of the ways to save our environment. With this thought in mind, the students of Grade 2 did the plantation activity. They planted the seeds of coriander in school's kitchen garden. 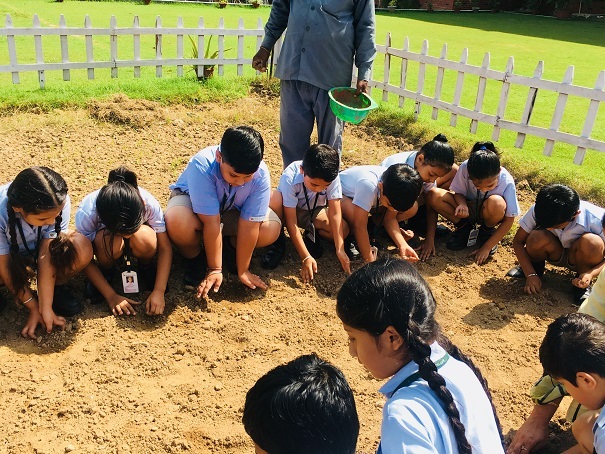 They are eagerly waiting now for their plants to grow.Such activities will inculcate the habit of care and love in the students not only for plants, but also for other living things. 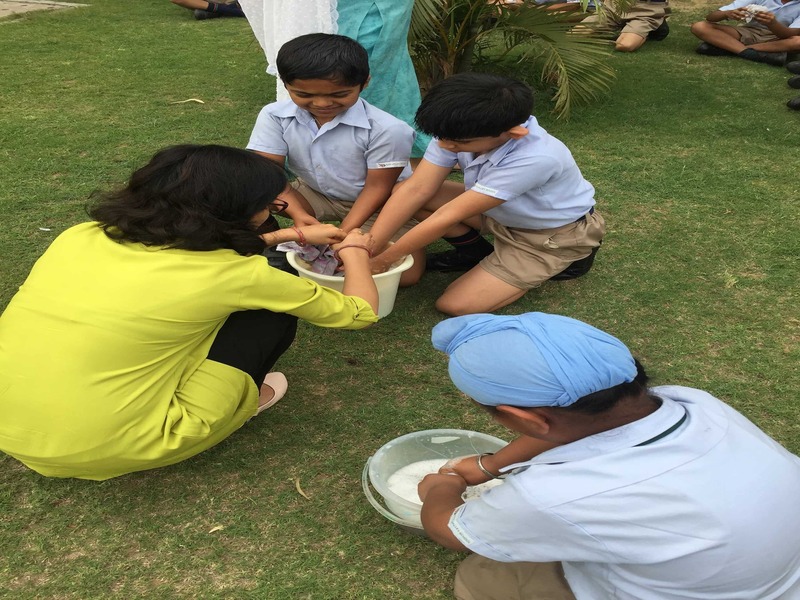 Students of Grade 2 of ATS Valley School, Dera Bassi did an activity on waste management. They reused pencil shavings for creative work. They made a beautiful scene of a duck in a pond by using these pencil shavings. Students were very happy to participate in the activity.Students learned that this way they can help in eliminating the waste and protect the environment. 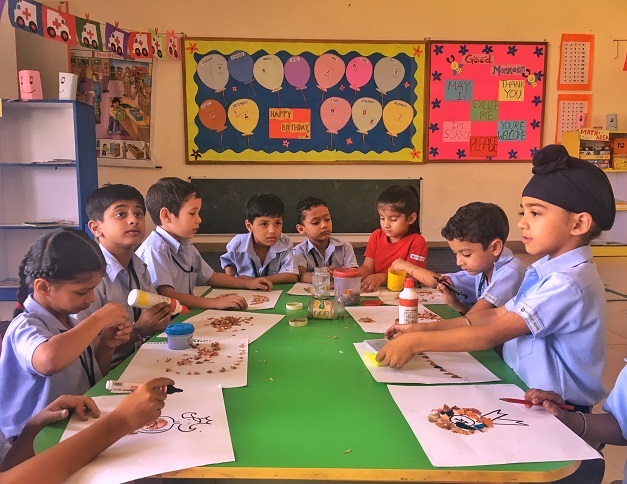 Class 1 of ATS Valley School, Dera Bassi has done Ambulance making activity in the class where the kids have learnt about the “I want to be' their ongoing topic of English. 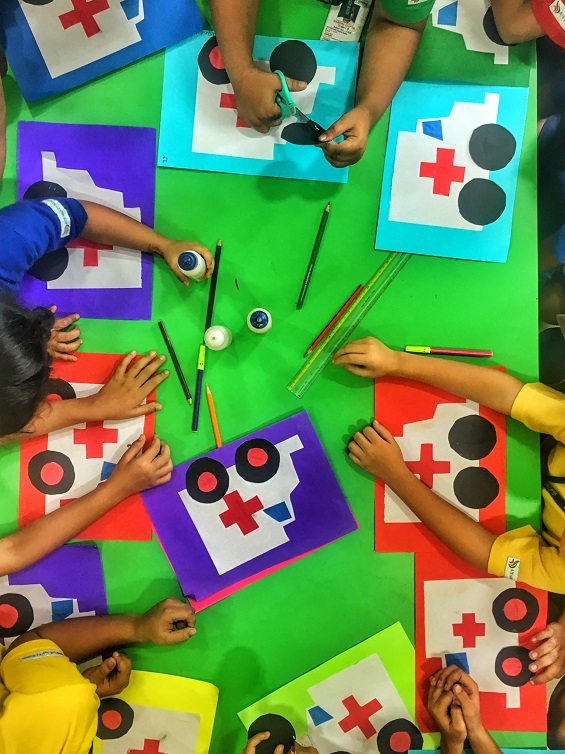 Children made this by paper cutting and pasting, they made tyres, windows and sign of cross and learnt the importance of emergency situations and when and how to call ambulance. The focus was on doing the things practically as they leave an impact on their mind as there is a well known saying that "I hear and i forget, i see and i remember, i do and i understand". The Students of Grade 4 participated in the Paper Dance Activity. Following the age-old tradition of Paper Dance, the students were taught about the concept of Fractions. Where one fold of a paper made one-half, two folds of the half made one-fourth. Along with elucidating how fractions were made, the students also learned about the addition and subtraction of the fractions. The activity made clear the concept of fractions for the students. The paper dance made learning of fractions fun & Interesting. 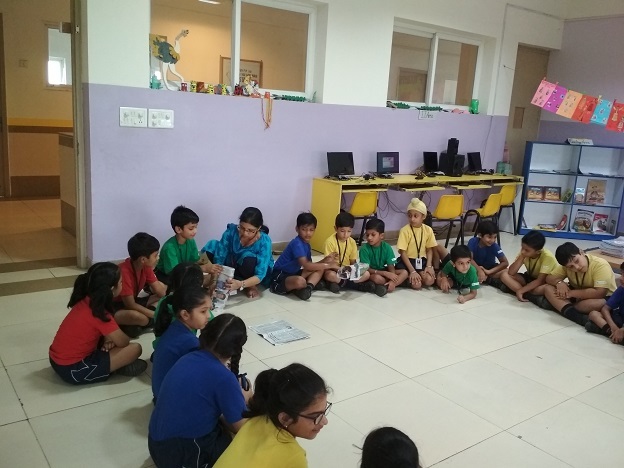 The students of Grade 4 of ATS Valley School, Dera Bassi were taught about the digestion of food in a human body via live visual representation of the process. Some food items (solids and liquids) were mixed and mashed in a polythene bag to give them an idea of food digestion that takes place inside a human stomach. Along with that, they were also taught about the length of small intestine and large intestine and further the whole process of digestion & excretion of human waste. The kids had a great learning experience by this visual representation of the digestion process. On the occasion of Rakhi , students of Grade 1 of ATS Valley School, Dera Bassi made their own rakhi with paper cutting,wool and coloured cotton balls.They were taught the importance of Rakhi celebration by the teachers.Students were very excited while making their own Rakhi and carry it to home. 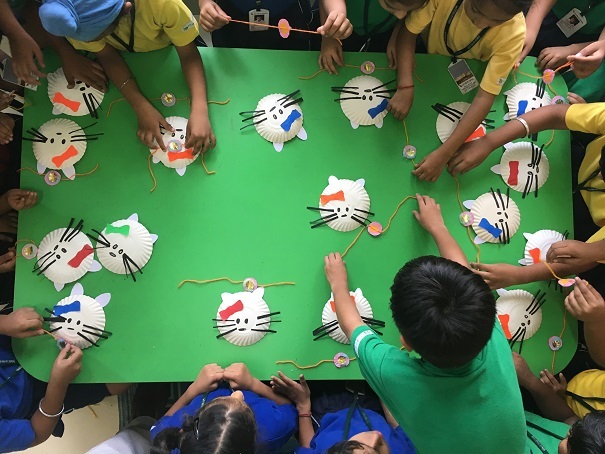 They made face of a Kitty in the class with the help of paper plate and paper cut outs.They were taught a poem on Little Kitty in the class.To make the teaching more effective the art work was done in the class to make the lesson interesting and clear to the students. 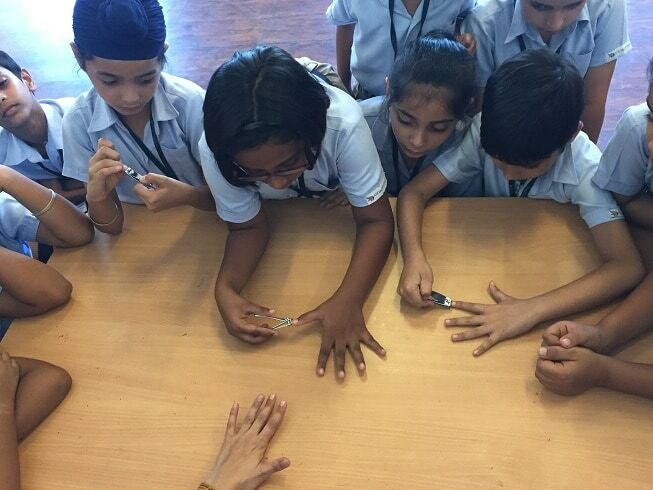 The students of Grade 4 of ATS Valley School, Dera Bassi did an activity on teeth in the class. The activity involved cutting papers in shape of a tooth on which students pasted slips of information appertaining to teeth. It included answers to questions like – What foods are good for our teeth? , What foods are bad for our teeth? , How are teeth useful to us and How can we keep our teeth healthy? It was a very insightful & informative experience for the kids along with a little creativity. 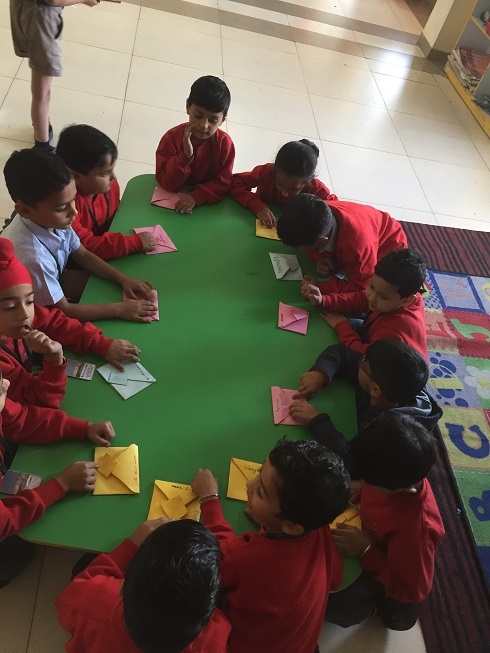 Instead of confining them to their classrooms, the students of Grade 3 were brought out in open by their teachers with their paper boats to enjoy the playful rainy weather when it was raining cats and dogs. Zoo is a great attraction for children. 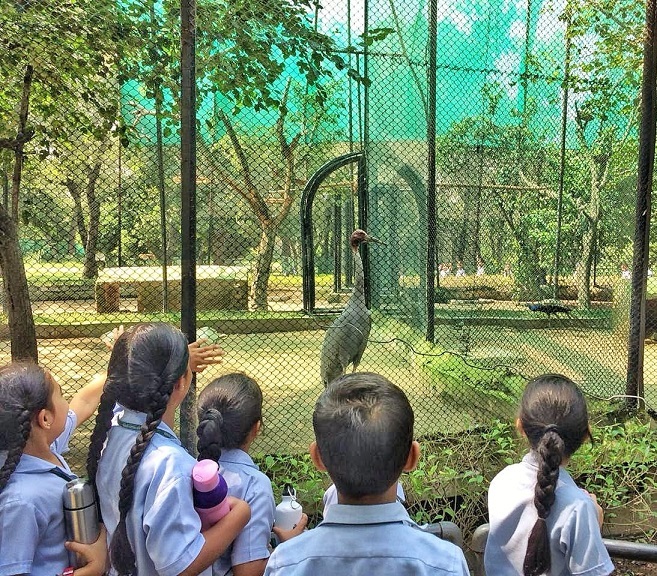 Students of grade 1 and 2 of ATS Valley School, Dera Bassi visited Chhatbir Zoo, which is one of the main attractions near Chandigarh. The students were very excited and eagerly waiting to see the different kinds of animals. They saw Bengal Tiger, Elephants, Panthers, Monkeys, Hippos, Zebra and many more. They also went to the snake house. Various kinds of snakes were kept inside glass enclosures along with different species of cobra, python and many other snakes. They were frightened to see the crocodiles. The huge crocodile was lying on the sand beside a pond. They also saw Crane, peacocks and many other birds. Finally, they returned back to school with a joyful heart. 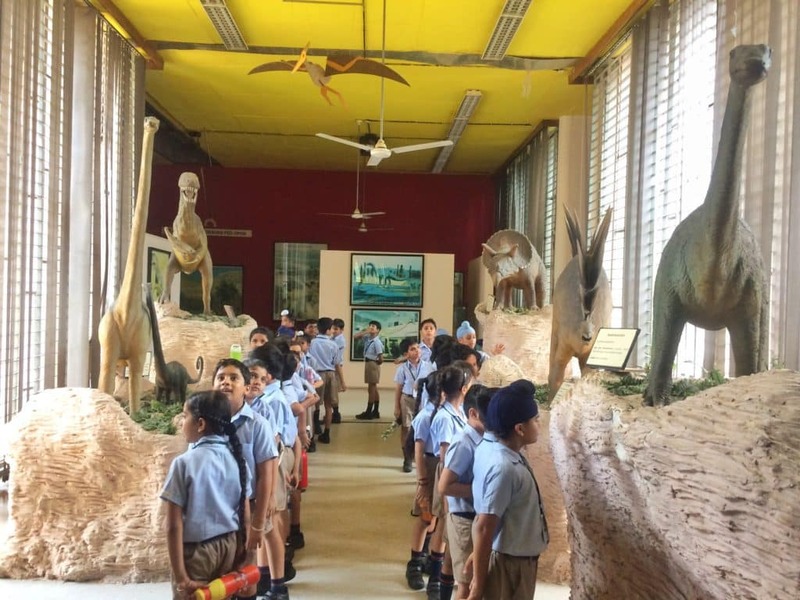 The students of grade 3 and 4 went to a field trip on 19.7.2018 to the Government Art Museum and Natural History (science) Museum in sector 10, Chandigarh. The school believes in imparting practical knowledge, knowing that children learn more by seeing and observing things around. So the excursion trips help them a lot. In that visit, the students learned about the evolution of man, fossils and saw different types of dinosaurs their preserved teeth, bones and eggs too. They also saw the currency of ancient India and the sculptures from the 1st and 2nd century. Overall it was a great experience for the students and they learned a lot from that visit. As we all know that in today’s time, everybody uses phone and internet to contact and to send messages to their near and dear ones, thereby reducing the use of postal services. 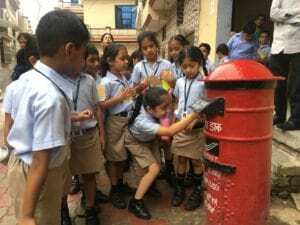 In order to teach our students about age-old postal services, we planned an educational trip to post office for Grade 2 students of ATS Valley School, Dera Bassi. Before going there, the school provided the students with postcards to write messages to their parents. All the Students were very excited about that trip.Mr.Ashwin Kumar (Postal Assistant) guided the students inside the post office and informed them about the process of sorting the letters, parcels and various duties of the postman. In the end, the students dropped their postcards in the letterbox. It was a delightful experience for the students. Notebook and book covering is a very important skill that a school student must know. It can help him in being independent and responsible, as he learns to take care of the books and notebooks and keep them neat and clean. So, the students of Grade 3 were taught how to cover the same with the help of a newspaper. 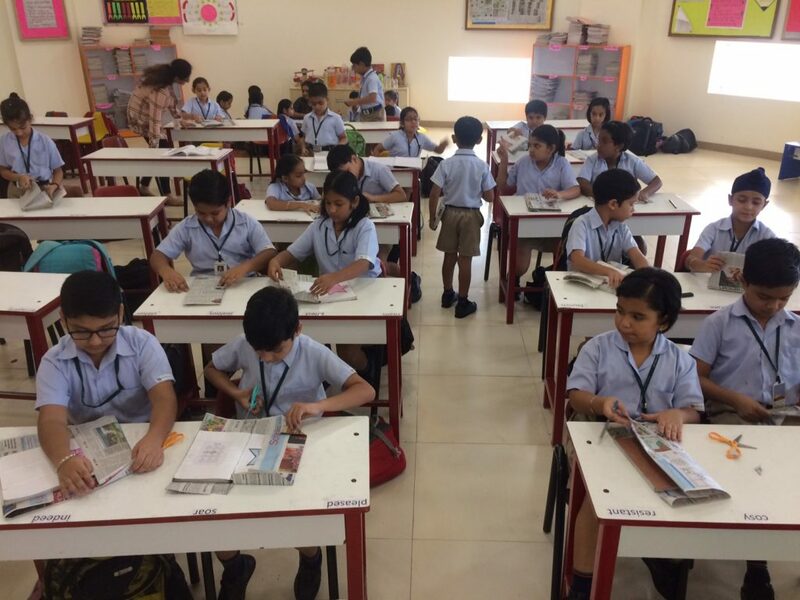 The students learnt the skill with a lot of excitement; they covered their school diary and their busy bee notebook with the newspaper. This activity created a sense of responsibility among them. Nothing says love and care like something created with your own two hands.And especially, when the same is done by our little ones. The Students of Grade 2 of ATS Valley School, Dera Bassi , learnt the life skill - wrapping a gift. They learnt how to wrap a gift neatly. They wrapped the gift boxes themselves and surprised each other. Such life skills helps in the overall development of the child by making them more smart and confident. Nail clipping being a very important life skill was taken up in Grade 3, as this age being apt to learn this skill. It was made more interesting by asking the students to wash their hands before clipping the nails off,thereafter explaining them that the nails become soft after washing hands, hence it becomes easy to cut them. Also it is generally recommended to trim the nails after taking a shower because at that time the nails become extremely soft. The students enjoyed the activity and they learnt the skill along the way. Skill development activity (Washing clothes) is successfully completed for grade 4th on 18th May,(Friday). 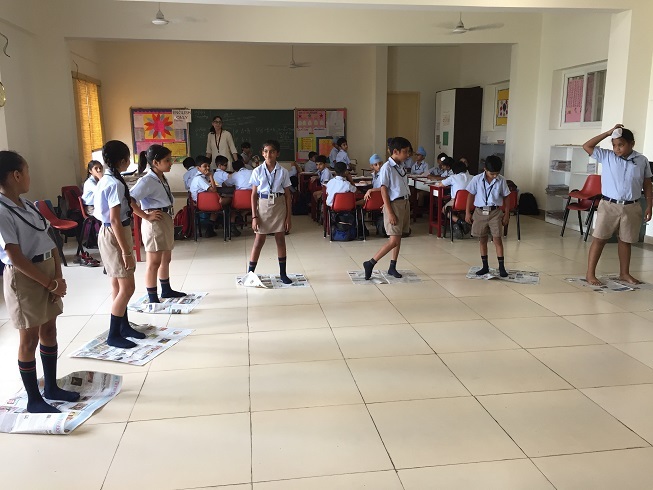 All students participated very actively and shown interest in this, activity performed using washing surf and Handkerchief. It's guided how to dry & fold clothes along with guidance on hygiene part for our body health. ATS Valley School, Dera Bassi conducted a special assembly on the occasion of Hindi Diwas. Students participated in the cultural programme which included recitation of poetry, Hindi speech, Dohas, Oath, Thought of the day and a Skit in Hindi. Students of grade 2 performed Masti ki Pathshala with great enthusiasm. They were very excited and worked very hard with their efforts. The topic was – we need shelter. Copyright © 2018-19 ATS Valley School. All rights reserved.